A distinctive fruity banana flavor and aroma matched with a light spicy clove finish. Our version of an authentic Bavarian wheat beer. 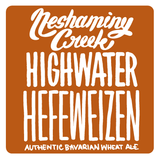 Brewed with nearly 60% white wheat, Pilsen malt, and a touch of Munich for color and flavor, we ferment this beer with an authentic German Hefeweizen yeast that gives it a distinctive fruity banana flavor and aroma matched with a light spicy clove finish. German Hallertau and Tettnanger hops are used exclusively in this brew making this beer as truly German and authentic as possible for a beer brewed outside of Munich.